ROBOT CHICKEN: SEASON 7. (DVD Artwork). ©Warner Home Video. 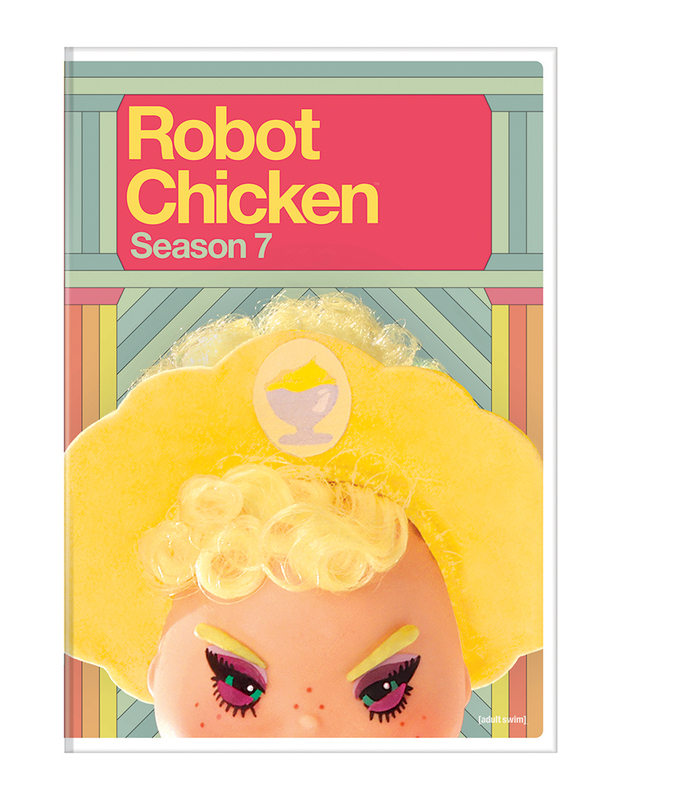 Adult Swim’s Emmy award-winning stop-motion animated series “Robot Chicken” hatches on DVD Tuesday, July 21, with 20 all-new episodes from Season 7. Packed with hours of bonus content, “Robot Chicken” Season 7 includes commentaries on each of the season’s episodes from the show’s creators and cast, deleted animatics, outtakes, interviews, behind the scenes and more. The material is rated TV-MA, for language. “Robot Chicken” uses stop-motion animation to bring pop-culture parodies to life in a modern take on the variety/sketch show format. The Emmy award winning series premiered in 2005 and remains among the top-rated original series on cable’s Adult Swim. The series is created and executive produced by Stoopid Monkey Productions’ Seth Green (from the “Austin Powers” movies) and Matthew Senreich. The duo also writes, voices and, with Zeb Wells, co-directs the multiple Annie award-winning series. Shailene Woodley (“The Fault in Our Stars”) and Theo James (“Underworld: Awakening”) reprise their outlaw characters in the blockbuster action-adventure, “The Divergent Series: Insurgent,” arriving on Digital HD Tuesday, July 21 and on 3-D Blu-ray Combo Pack (plus Blu-ray, DVD and Digital HD), Blu-ray (plus Digital HD), DVD (plus Digital) and On Demand Aug. 4. Based on Veronica Roth’s best-selling novel, “Insurgent” raises the stakes for Tris (Woodley) as she searches for answers and allies in this action-packed second installment of the popular sci-fi series. On the run and targeted by ruthless faction leader Jeanine (Academy Award winner Kate Winslet, “The Reader”), Tris fights to protect the people she loves, facing one impossible challenge after another as she and Four (James) race to unlock the truth about the past and, ultimately, the future of their world. Joining Woodley and James is a star-studded ensemble cast including Academy Award winner Octavia Spencer (Best Supporting Actress, “The Help”), Jai Courtney (“Terminator: Genesys”), Ray Stevenson (“Thor”), Zoe Kravitz (“Mad Max: Fury Road”), Miles Teller (“The Fantastic Four”), Ansel Elgort (“The Fault in Our Stars”) and two-time Oscar nominee Naomi Watts (“The Impossible”). The action movie is directed by Robert Schwentke (“RED”) and written for the screen by Brian Duffield and Akiva Goldsman and Mark Bomback. The first two “Divergent” films grossed more than $500 million in worldwide box office. The 3-D Blu-ray Combo Pack and Blu-ray are encoded in Dolby TrueHD and feature a Dolby Atmos soundtrack, which delivers highest quality sound that places and moves audio anywhere in the room, including overhead. “The Divergent Series: Insurgent” 3-D Blu-ray Combo Pack, Blu-ray Combo Pack and DVD will be available for the suggested retail price of $39.99, $35.99 and $29.95, respectively.